We think about the judges as both a period of time and a book of the Bible. The period of the judges began after the death of Joshua in the early 14th century BC (Joshua 24:29) and continued until Saul was crowned king of Israel by the prophet Samuel in 1051 BC (1 Samuel 10:24). 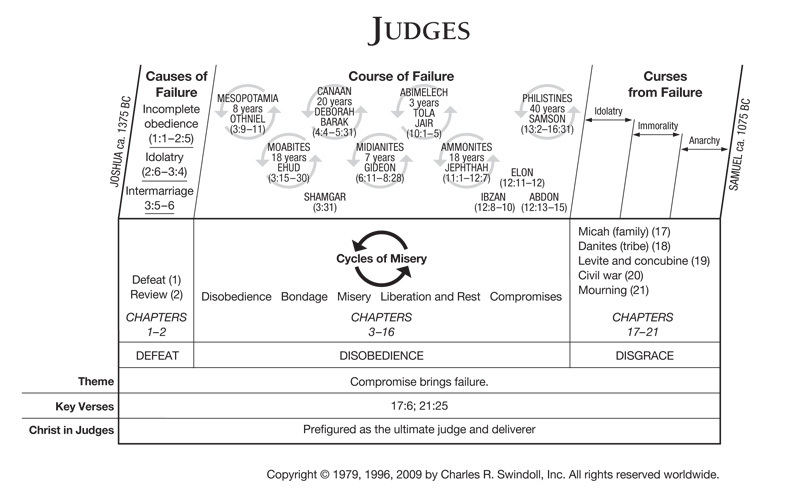 The book of Judges acts as the sequel to the book of Joshua, linked by comparable accounts of Joshua’s death (Joshua 24:29–31; Judges 2:6–9). Events within the book of Judges span the geographical breadth of the nation, happening in a variety of cities, towns, and battlefields. Scholars believe some of the judges ruled simultaneously in separate geographical regions. Attempts to calculate the exact amount of time covered in Judges are inconclusive, but generally, the book begins soon after the death of Joshua and ends in the years just before the entrance of Samuel onto the scene, a period of about three hundred years. The time of the judges brought about great apostasy in Israel. The nation underwent political and religious turmoil as the people tried to possess those parts of the land that had not yet been fully conquered. The tribes fought among themselves, as well, nearly wiping out the tribes of Manasseh (Judges 12) and Benjamin (20–21). The pattern of behaviour in the book of Judges is clear: the people rebelled through idolatry and disbelief, God brought judgment through foreign oppression, God raised up a deliverer—or judge, and the people repented and turned back to God. When the people fell back into sin, the cycle started over again. Find resources in the book of Judges in our resource library.